Boy band the Backstreet Boys marked their 20th anniversary and their upcoming world tour by getting a star on the Hollywood Walk of Fame. 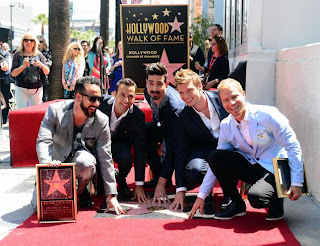 "Backstreet is Back ... and we aren't going anywhere," Nick Carter, 33, told fans as all five members of the 1990s band gathered to unveil their star - located right next to another popular boy band, Boyz II Men. The close harmony singers were visibly emotional as they thanked their families and fans for their support over the years. "What an honor it is," said Kevin Richardson, 40, holding back tears. "What a beautiful day. What another beautiful way to celebrate 20 years together." Formed in 1993 in Florida, the Backstreet Boys went on to sell more than 130 million albums worldwide and score hits like "I Want It That Way," and "Shape of My Heart." The other members of the group are Brian Littrell, A.J. McLean and Howie Dorough. After several hiatuses in the 2000s and the departure of Richardson, the five original members officially got back together last year and will embark on a world tour in May, starting in China. Backstreet Boys are also due to release a new album this summer, and a music documentary in 2014. Before Britney Spears releases her in-the-works eighth studio album, the pop superstar will return with "Ooh La La," a new song featured on the soundtrack to the "The Smurfs 2." The 31 year old broke the news to her fans on Twitter yesterday. She tweeted: "Remember that surprise song I recorded for my boys? It's coming soon! #OohLaLa for #TheSmurfs2 :) Stay tuned for more..."
"Ooh La La" was produced by Spears' "Femme Fatale" collaborators Lukasz "Dr. Luke" Gottwald, Ammo Cirkut, while Bonnie McKee, J Kash, Lola Blanc and Fransisca Hall all score writing credits. The song will play at the end credits of the film, which hits theaters on July 31. "I have always loved the Smurfs as a kid and now my boys are the biggest Smurfs fans EVER," Spears said in a press statement. "I wanted to surprise them with a song in the movie. I know they'll think it's Smurftastic!" The Rolling Stones unveiled details of their biggest tour in six years on Wednesday, playing dates in North America and Britain after a stage comeback last year to celebrate 50 years in music. The band said they would kick off their "50 and Counting" tour in Los Angeles on an unspecified date but would then play Oakland, California on May 5 and eight other cities including Toronto and London, UK. 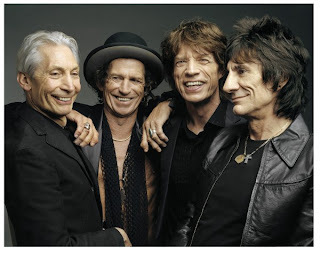 To celebrate 50 years the band also released a greatest hits collection, a documentary, and a photographic book and then sparked rumors about more concerts with a March 29th post on their website that said "5 Days & Counting..."
The Rolling Stones, which are comprised of Jagger, Keith Richards and Ronnie Wood on guitar, and Charlie Watts on drums, emerged alongside The Beatles in the early 1960s. They became one of the most successful groups in rock and roll history with hits such as "(I Can't Get No) Satisfaction," "Jumpin' Jack Flash" and "Sympathy for the Devil". The band has toured 40 times in a five-decade career, mostly across Europe and North America in the 1960s and 1970s.They last went on the road for their "A Bigger Bang" tour from 2005 to 2007, playing 144 shows globally and grossing more than $550 million, one of the world's most lucrative tours.